Derwen Church passed to the Friends in 2001/2 following a declaration of redundancy. 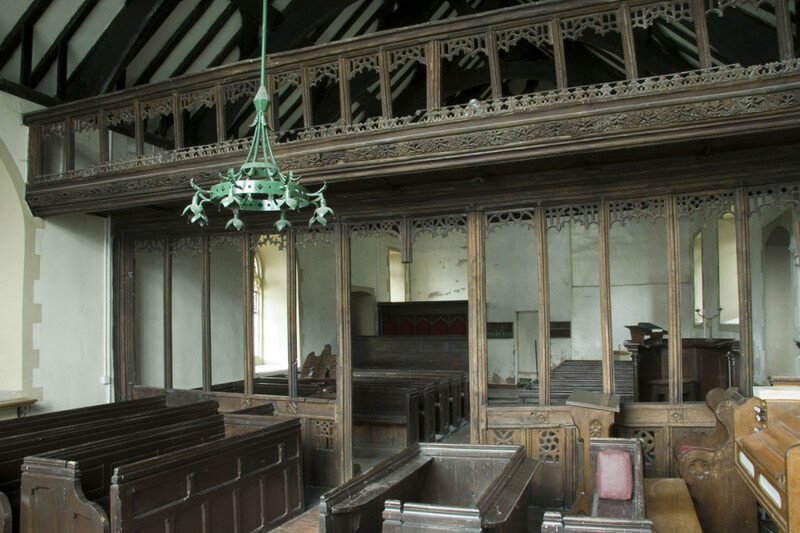 It is principally renowned for its medieval rood screen and its arched-braced roof also of the late medieval period. It also retains a font dated 1665 and two good Victorian stained glass windows, the second from the east on the south side being designed by H.E. Wooldridge and made by James Powell & Sons in 1869. The external double western bell-cote is dated 1688. In the churchyard you will notice a very fine mid or late fifteenth century churchyard cross depicting the coronation of the Virgin, the Crucifixion, the Virgin and the Child and an angel with scales assumed to be St Michael. The cross, the churchyard and the lychgate with schoolroom above are still the responsibility of the parish and are not owned by the Friends. St Mary’s is listed Grade I.